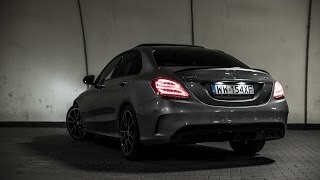 A new member to the family of AMG sport, the all new C450 AMG Sport 4MATIC 2016 is class-leading amalgamation of performance and features, as shared the model is said to make its place between the Mercedes Benz C-Class and C63. 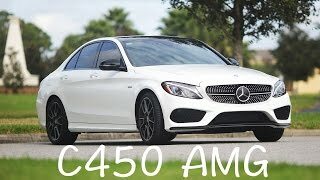 TO get the model a little clear all you gotta do is imagine a redesigned C400 4MATIC, dedicated to bring better performance and drag more buyers towards the essence of AMG. Let’s learn more about the model under different headings. The interior of Mercedes Benz C450 AMG Sport 4MATIC 2016 is distinctive in its own way. With thorough works of Artico in making of upper edges of body, arm rests and parts of center console the man made leather gets mixed with Dinamica to create the upholstery with blend of red stitching. The contrasting red stitch follows to the black door mats barbed red and the ferocious looking safety belts in red are a sporty addition from design. The sporty layout adoring the arena offers you comfort through its sitting while the flat bottom three-spoke steering wheel drenched in nappa leather adds a class to front. 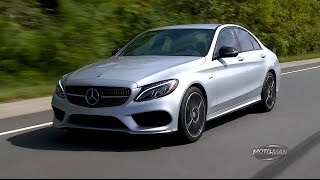 Unlike interior, exterior of Mercedes Benz C450 AMG Sport 4MATIC 2016 isn’t much distinctive but we expect the sleeper look might gain buyers eyeballs. Talking about the front fascia of C 450 AMG Sport 4MATIC, differences begin with the ‘star grille’ meshed in diamond pattern with a horizontal bar edging the emblem embarked on each side. However the rest is just the same saga narrated from any other C-class. The rear though in comparison carries major differences, making the queue are the new four exhaust pipes, aerodynamic diffuser and trunk spoiler accompanied by special badging made for this special model. The side look of C450 AMG Sport 4MATIC is also very well designed with and give a ferocious look with its five-spoke lightweight alloy wheels getting the essence of class with AMG badges all across front wings, mirror housing, waistline strip and window frames. 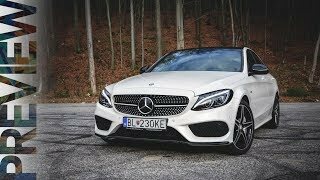 Mercedes-Benz C450 AMG Sport 4MATIC 2016 gets its power through a 3.0 liter V6 engine delivering 367 horsepower and 520 nm torque mated to seven speed automatic transmission. This till date capsulated most powerful twin turbocharged is also the first in house which is not hand-built. 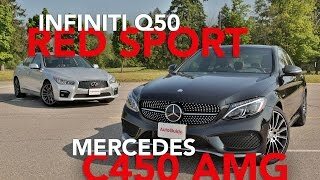 The engine of C 450 AMG Sport 4MATIC is capable of achieving top speed of 155 mph and the acceleration power from 0-62 mph stands firm at 4.9 seconds.